the basil is really bushing out in the garden these days. to help encourage the basil to form new branches and leaves and to continue growing throughout the summer, i cut back to the top two leaves and try to remove flower buds immediately. the basil prunings have been being put to good use around here to make a favorite summer snack. 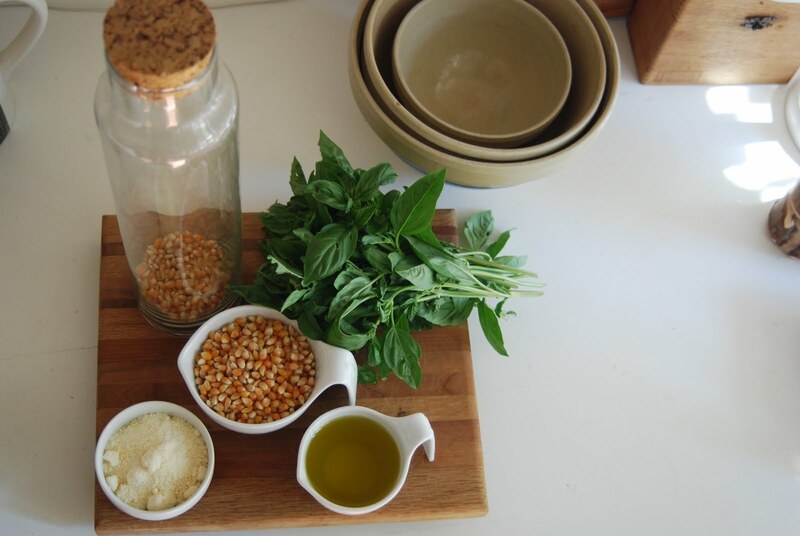 in a food processor mix the oil and basil leaves and set aside. 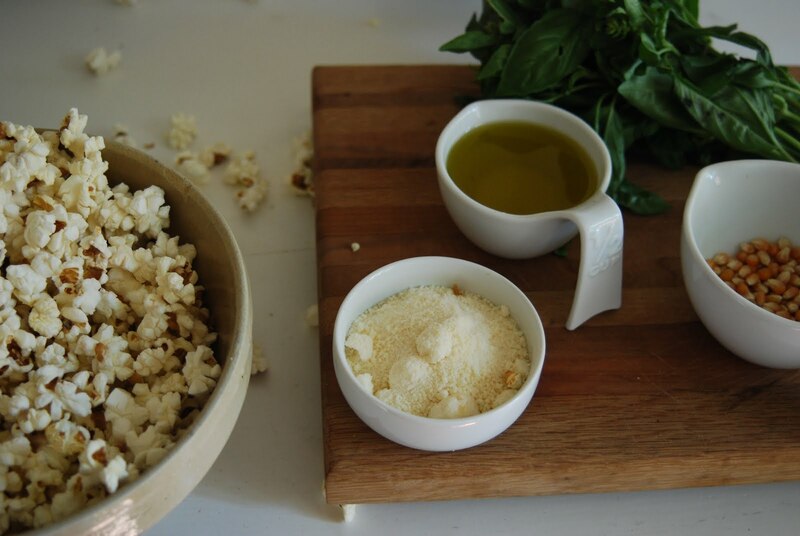 pour basil-oil over popcorn and mix thoroughly. sprinkle with parmesean, salt and pepper to your liking. we like ours on the cheesy side. pour yourself a glass of fresh squeezed lemonade and enjoy! That looks so delicious! I will have to try it. I've been looking for uses for my basil besides pasta and pizza dishes. oh my this looks wonderful! i think it shall be lunch for today. that looks amazing. I love making popcorn and will try this! Ooooh and rosemary, thyme, so many possibilities! oh my goodness. I am totally making this! how wonderful! we have tons of basil and this would be such a great way to put it to use! thanks for sharing. What a fantastic way to enjoy basil! Our plants are just coming on now (late season), so soon I'll have enough to try this. It sounds delicious! Thank you for sharing. This looks so delicious! The basil in my garden hasn't taken off yet but once it does I'm all over this. This looks great - I have lots of basil! We just made popcorn on the stovetop last week, but it was a bit bland - so this will be quite tasty! Oh this looks wonderful! Just found you via Soule Mama. Thank you for the recipe! i made this the other day but popped the popcorn in oil on the stove, the result was too oily with the extra basil oil (but boy did it smell good and taste good, just too soggy). i just noticed you air popped yours so i am excited to try again with an air popper. 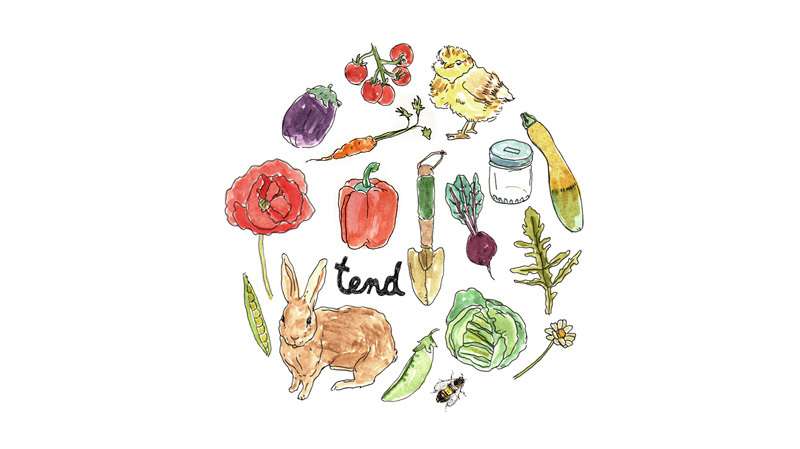 do you have any suggestions that maybe i overlooked besides that? thanks!! I'm going to try this with our basil crop! Sounds yummy! As Agen Bola Online Agen Ibcbet Agen Sbobet I just wanted to compose a small note to be able to thank you for all the unique hints you are sharing at this website. My rather long internet lookup has at the end of the day been recognized with beneficial details to exchange with my family and friends. I 'd point out that we readers are really blessed to be in a very good network with so many awesome people with valuable opinions. I feel very much blessed to have used your website page and look forward to many more fabulous moments reading here. Thanks a lot once more for all the details.